The 9th hole on Streamsong Black is a fun punchbowl green, with a flag in the middle that you can’t always see. There’s a windmill behind it, so the caddies recommend you pick a side and aim left or right. I’m driving but starting to squint skeptically at my GPS lady. This can’t be right. I’m about an hour southeast of my home in Tampa and about ninety minutes southwest of Orlando International Airport. I pass Fort Lonesome, a Florida ghost town that had a brief heyday in the 1930s when a sawmill and two stores, now long gone, gave it a fleeting town-like vim. The surrounding terrain begins to change, looking more rugged and grim as I pass the Hardee Correctional Institution. Fewer and fewer buildings populate the roadside. The Central Florida scrub, with its meager soils and fierce wildlife, reminds me of Patrick Smith’s historical novel A Land Remembered. The book’s main character, Tobias MacIvey, moves his wife Emma and infant son Zechariah to land like this. The MacIveys eke out a living in this inhospitable landscape, each successive generation pushing back against starvation, mosquitos and hurricanes. 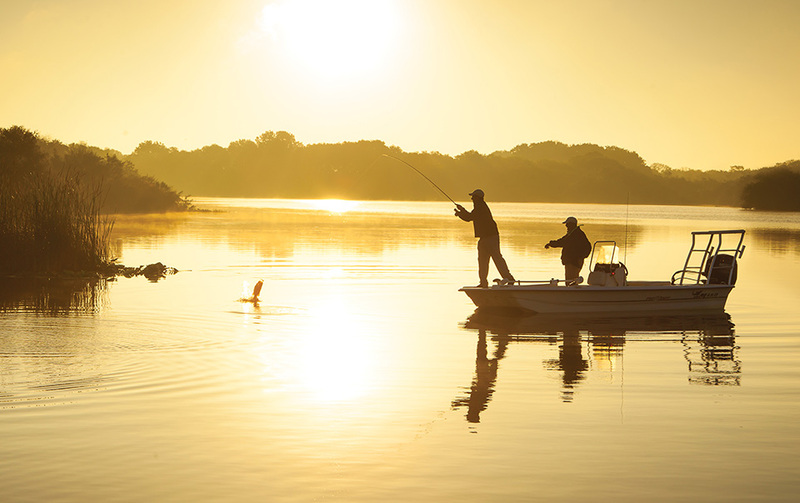 Guided bass fishing is just one of many outdoor pursuits available to guests at Streamsong resort. My mind drifts away from the classic required reading for every Florida student and back to this thought: Who puts a world-class golf resort way out here in rural Central Florida? But then I see it, a demure sign off Fort Green Road. Streamsong Drive. I’ve almost arrived, on assignment to check out the luxury resort and its restaurants, and all of a sudden nothing about this looks like Central Florida. The terrain could be the wind-swept hills of Ireland or Great Britain, or the dunes of New England’s swankiest coastal communities. Finger lakes appear, along with 100-foot-tall grass-fringed dunes, swales and elevation changes. Streamsong Golf Resort and Spa is set on 16,000 acres of land formerly utilized as a phosphate strip mine. The land was mined for nearly 100 years, most recently by Mosaic Company, a leading global producer of phosphate and potash fertilizer components. Strip mining typically removes 15 to 50 feet of the surface of an area to get to the pebble phosphate, moving the “overburden” (the sandy layer above the phosphate) hither and yon. Companies pulled more than a million tons of phosphate rock out of the area, in the process stockpiling 15 million cubic yards of sand, changing the topography, water flows, animals, plants and entire ecosystem. Pro Tips on How to play the award-winning firm-and-fast 18-hole, par-73 course, Streamsong Black. 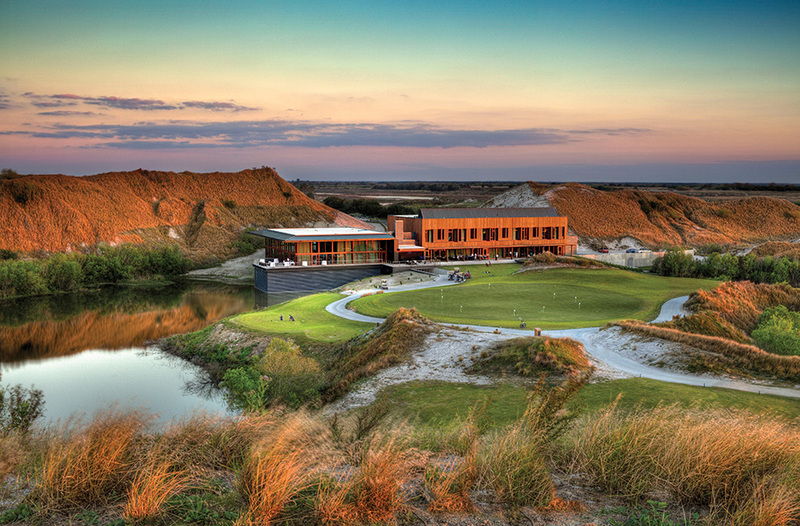 The large dunes around the Streamsong property resulted from 100 years of phosphate mining. And then the phosphate was gone. Nature took over and redecorated. Blown by decades of wind and Florida’s fierce rain storms, the land gained rolling hills and oddly appealing geographic anomalies. This swath of rural Bowling Green is at once a manmade piece of Florida and something ruggedly, lushly natural. The natural setting and the luxurious amenities like the outdoor pool promote a sense of serenity. A few big names took note—this was the peak of the financial crisis, near the end of the aughts. The first two Streamsong golf courses opened in late 2012. 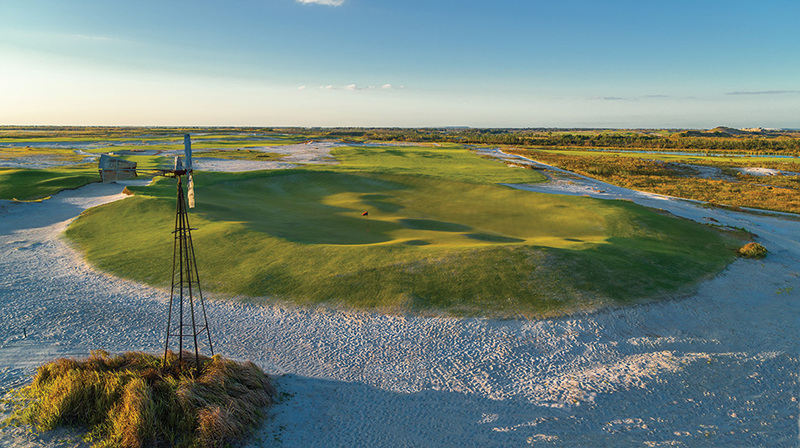 Bill Coore and Ben Crenshaw designed the Red course, and Tom Doak was responsible for the Blue course, with both creations immediately wrangling key spots in Golfweek’s “Top 100 Modern Courses.” Streamsong’s Black course opened in September 2017 and was designed by Gil Hanse and Jim Wagner, who designed the Olympic golf course in Rio de Janeiro. But first, let’s back up. Millions of years ago, this area was a shelter for humpless camels, mastodons and hornless rhinos, whose bones sifted downward and created the phosphate rock deposits discovered in the 19th century. Folks call it Bone Valley because of the richness of those ancient creatures’ remains. If you read Mosaic’s literature about land use, you’ll see the region discussed as a prototype for post-mining economic and environmental sustainability. That’s all well and good, but once you pull up on the property and see the lodge, which was designed by Alfonso Architects in Ybor City and opened its doors in 2014, sustainability and mastodon bones may slip your mind. This place is gorgeous. Its main Leaf Lounge, mirrored to reflect Florida’s sherbet-colored sunsets, is segmented with yellow louvers that read like ribs on a huge prehistoric creature. The whole building is study in glass, steel and reclaimed timber. At once modern but sinuously organic, it’s an extension of the land around it, or maybe even something excavated from its depths. The 300,000-square-foot resort boasts 216 rooms in the main lodge, plus 12 rooms in the golf clubhouse, a world-class spa, five restaurants and generous conference center space. But maybe architect Alberto Alfonso had those millions of years of sifting bones in mind the whole time. The lodge’s design has four layers: dubbed Submersion, Bank, Canopy and Sky. Inside the spa, “petrified tree” columns surround the seven pools. I took a walk, first wandering through the Submersion level, home to the AcquaPietra spa. With more staff than patrons around on that day, the spa resembled a serene 7,000-square-foot grotto. 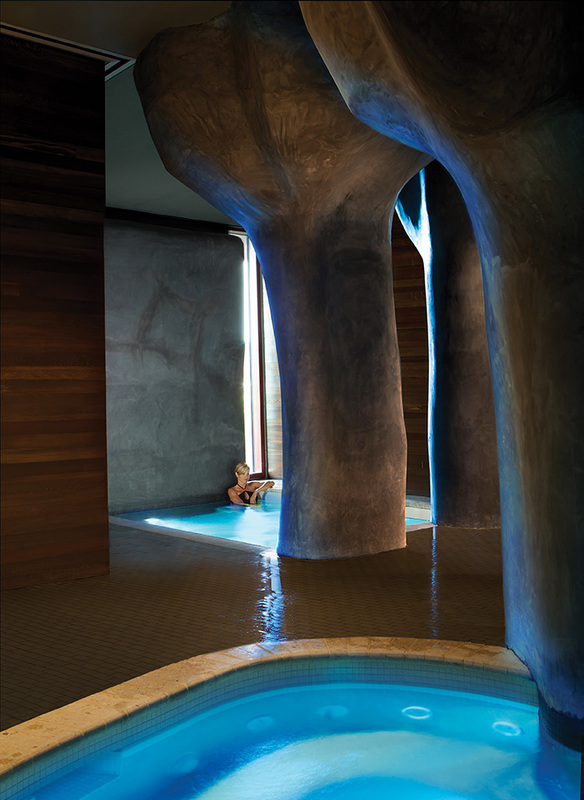 I saw six indoor pools set to a range of temperatures from 42 degrees to 104, steam, sauna, private rooms for massage and a salon, all of it with organic curved walls and massive concrete “petrified tree” columns, motifs echoed in SottoTerra, the resort’s intimate fine-dining restaurant. SottoTerra seats up to 40 amidst a muted grey-and-marble color scheme that focuses attention on the views of Little Payne Creek outside, a lake with guided bass fishing for when golfing has lost its luster. Those treelike columns separate the attractive lounge from the dining room, which is dinner-only, meaning that I had to keep moving in search of my lunch. But first I had to ascend to the Sky area, where there’s a patio and a lounge named “Fragmentary Blue” after the Robert Frost poem of the same title. At the entrance is a lapis-colored wall and a painting of a single bird in a tree with the deep cerulean sky behind it. Outside on the patio, a giant blue mosaic tile wall echoes the theme. 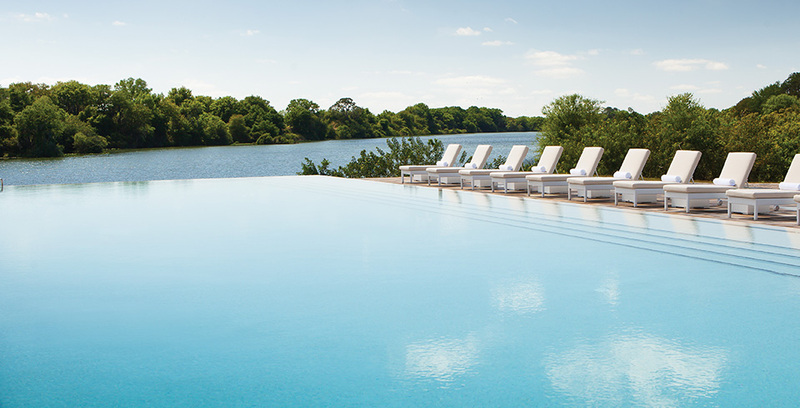 From the lounge, which serves cocktails and hors d’oeuvres in the evening, there is a 360-degree view of the property: The clay shooting and archery are to one side, then the tennis courts and the 1.7-mile walking loop around the lake. But on this day, all was quiet on the courts, on the path and in the lakeside infinity pool. Golf may not be everything, but it’s surely top dog at Streamsong, where gaggles of polo-shirted gentlemen are eager to cross Red, Blue and Black off their bucket lists. 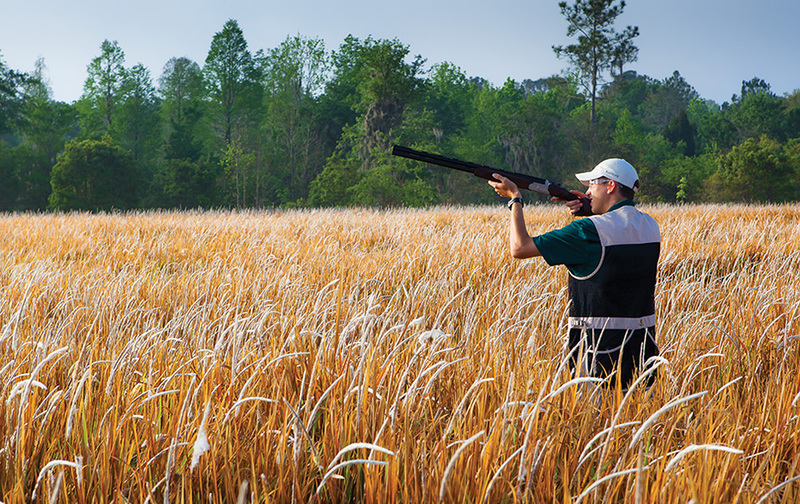 Guests can take aim at more than golf balls with clay shooting and archery. Back down inside the Bank, the area that houses the public spaces and main lobby, plus a little history room, where you can see mining memorabilia and an enormous megalodon jaw unearthed by Mosaic workers. I hopped in my car and took a quick ride over to Bone Valley Tavern at the Black course’s clubhouse. Sleek and modern, the clubhouse has a casual vibe with a long rectangular bar ringed by dozens of high seats and a huge patio with tables and low-slung chairs, all protected from the elements by a sleek wooden overhang. The manicured greens are just beyond the floor-to-ceiling windows, juxtaposed with poufs of native grasses, live oaks fringing the sand traps and little herds of golf carts convening like animals on the savanna. 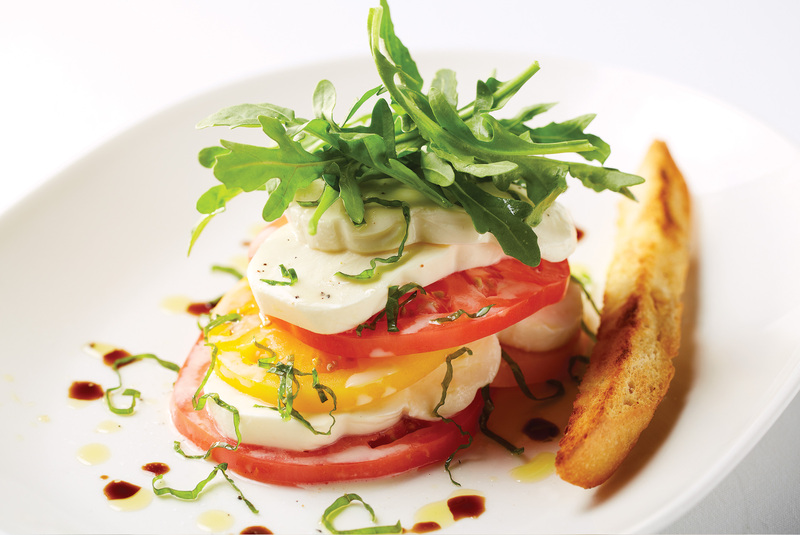 I ordered a caprese salad—tiny heirlooms with plush, cherry-sized fresh mozzarella balls and a tangle of nicely dressed mesclun mix—while I perused the rest of the menu. At lunch, the tavern serves spins on classic American fare like a short rib grilled cheese, truffle steak fries and a smokehouse club sandwich. At dinner, the culinary philosophy hews to sophisticated comfort foods: roast chicken in salsa verde, lemongrass snapper accompanied by the sweet-and-bitter combo of curried sweet potatoes and charred broccolini. How about lunch No. 2? I zipped back in the car and drove over to Restaurant Fifty-Nine, a clubby, more old-school space where huge sand dunes largely occlude the view of the legendary golf courses outside. Brown leather upholstered booths and chairs were largely taken up with men in polo shirts; eavesdropping, I heard conversations evenly split between rehashes of each hole and business machinations. The restaurant’s menu seemed fitting: wet- and dry-aged prime steaks with suitable sauces and accompaniments (lobster beurre monte and roasted mushrooms, but in lieu of creamed spinach, how about a nice saute of greens dotted with crispy lardons?) and other composed dishes that say “luxe” without being fussy. Oh, I see my prey: It’s sumptuous but oh-so-Florida. A butter-poached lobster roll on crisp, toasted brioche, a little Florida citrus aioli moistening and heightening the plush seafood. At once messy and sophisticated, it was a sandwich I was almost glad to eat alone for the purpose of sheer focus. The gaggle of golfers dwindled as time went on, and I took in the scrubby, shrubby Florida native plants outside, kissed by the golden-hour sun. It’s clear that the central draw at Streamsong is the three must-play golf courses sculpted out of this wild terrain. They are built into the sandscape and inform the buildings’ orientation and the meandering roads that crisscross the property. I didn’t see the guest rooms and suites in the Canopy area, where Alberto Alfonso created paintings for each room that follow a schematic of the seasons. But I’m told each room contains a copy of A Land Remembered after Alfonso himself insisted that visitors be encouraged to dive into the hard-knock tale of the MacIvey family’s relationship with the land. 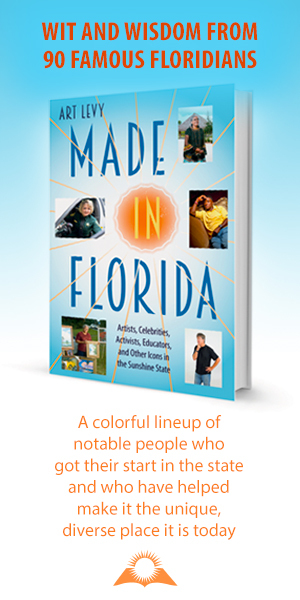 A fictional account that feels like Florida history, it’s worth rereading. In a way, this is what Mosaic has done with Streamsong, recasting and repurposing 16,000 acres in the center of the state to tell a new story, with Bone Valley palpable just beneath the surface.